Chattanooga Zoo Activities Coordinator James Brantley visited Morning Pointe of Collegedale at Greenbriar Cove and The Lantern at Morning Pointe Alzheimer's Center of Excellence — and took a fluffy friend with him. 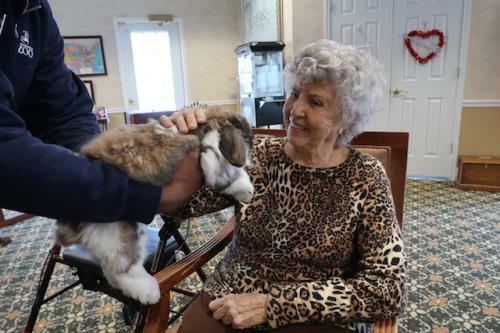 The assisted living and Alzheimer's memory care communities' residents got the chance to pet a long-eared Angora rabbit with silky smooth fur. “We love when the Chattanooga Zoo comes to visit!” said Naomi Schumacher, the Life Enrichment director at Morning Pointe of Collegedale at Greenbriar Cove.